Gear for all your Club & Party needs. That's right - all the Light Sticks, LED Rave Gloves, LED Lights, Rave Toys, EL Wires, EL Shirts and other Glowing items you have been looking for all in one place. Perfect for your rave, dance or theatrical needs. Add a touch of light to all your performances and you'll be the star of the show! Way beyond other green lasers! This pointer creates a galaxy of stars where ever you point it. 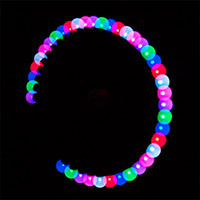 With 8 modes and 6 selectable colors this poi ball is a rainbow of fun! These mitts offer the ultimate in individualized color control, with completely separate controls at each finger tip which then can be set to any of 6 multicolor and single color modes! Hundreds of different light combinations create totally unique lightshows! Now available in our popular black glove variation, making the gloves invisible in the dark for a total focus on the LEDs. 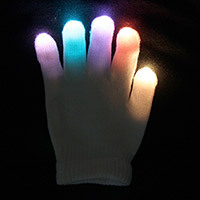 LED Gloves are a great way to create your own light show. Bright LED lights in the fingertips will show off your skills as you move to the groove. Just getting started? No problem - choose a LED Glove style with a single easy to use controller button to quickly select one of over 6 light modes. Ready for more? Try one of the Color Control LED Gloves that gives you complete control over each individual light and let your fingers do the talking. Going Pro? 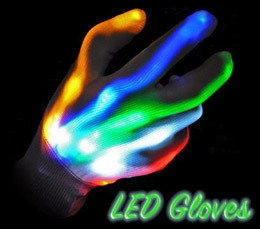 Design your own LED Gloves with your choice of high quality Gluvmax microlights and you'll be ready to rock!